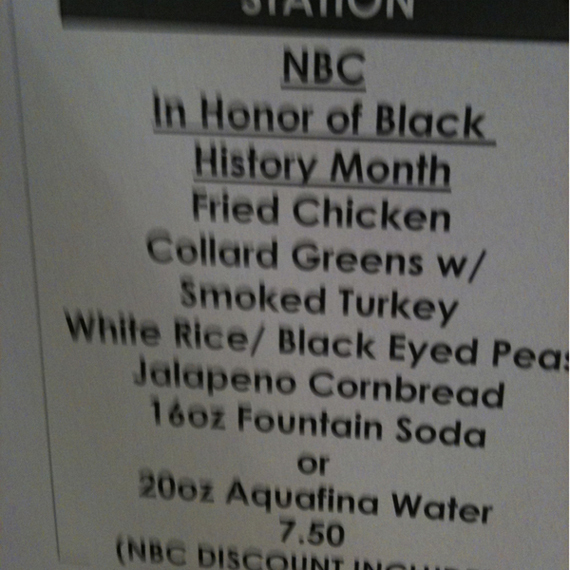 In honor of Black History Month, the NBC cafeteria served fried chicken, collard greens, and jalapeno cornbread today for lunch. The picture below was snapped by Questlove, the drummer for the Roots--Jimmy Fallon's house band. He was also the musician that pointed out via Twitter that Conan spent half a million dollars on a walk-out song for Tom Hanks during his last episode. UPDATE: Questlove just tweeted: "i think i need a twitter break. i done started something. and now i must put out fire." Apparently, NBC is not thrilled with this attention. UPDATE II: NBC has removed the sign from the cafeteria and apologized if it offended anyone. The chef, Leslie Calhoun -- who is black -- said she has been trying to institute a special Black History Month menu for years and was allowed to do so for the first time this year. She said doesn't understand the controversy. "I don't understand at all," she told NBC partner site TheGrio. "It's not trying to offend anybody and it's not trying to suggest that that's all that African-Americans eat. It's just a good meal. I thought it would go over well."